Check the Links at the bottom of this page for my Custom figures! A lot of things inspire me to do my own customs and kitbashes. Sometimes it's just a piece of equipment, clothing or a weapon that makes me want to do my own special figure. Sometimes it's a headsculpt that one of the toy companies makes that either represents somebody or bears a huge likeness to a famous person or actor. Whatever it is, I must admit I owe a HUGE thanks to many people who make my customs possible. Some are immensly talented artists. Some send me invaluable material or suggestions. Whatever they do I owe them alot and their work is represented here just as much as my own. There are so, so many more who did trades, offered suggestions, contributed to my website, email me, etc, etc. This is a great hobby. Clark Gable enlisted in the Army Air Corps during World War 2 and mainly did training and morale films for the Army. He did manage to get in some flight time on a bomber mission but the Army did not want him to on the front lines. 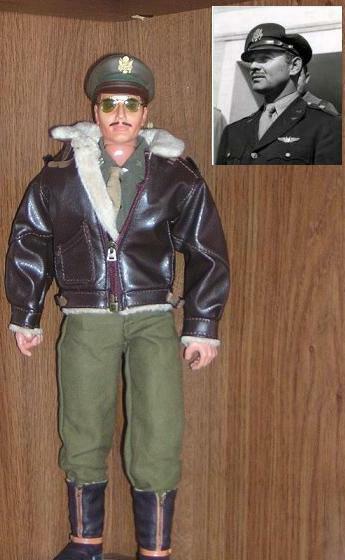 Gable managed to smuggle himself onboard a flight without the knowledge of his superiors. The problem was Gable was already world famous as a movie actor. Hitler himself admired Gable's work. It would have been a huge propaganda victory if the Germans would have been able to shoot Gable down on a mission over Europe. Click on these links to see my special figures!